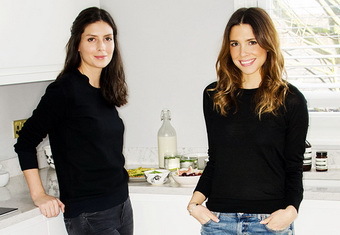 Founded by Anneli Bush and Charlotte Diaz de la Vega, SUSTAIN THE GLOW is an online guide to glowing from the inside out for all you busy, on-the-go and health conscious people out there. What started off as two friends supporting each other in a complete mind, body and wellness journey has now become a full-time lifestyle. Over the past year they’ve been inspiring people around them, culminating in the creation of this platform for them to share their experiences and ideas with a broader audience. Many people are unsure where, and how to start the journey towards everyday healthy living; often put off by it being too time-consuming, expensive, confusing or just too overwhelming. SUSTAIN THE GLOW is here to try making that process a bit easier for you, sharing with you how you can do things realistically on an every day basis by following our tips and tricks, recommendations and personal experiences with focus on a sustainable and healthy lifestyle for the long-term. Wanting to create a simple, clean and straight-to-the-point website, the team will be bringing you news, trends and tips from two of the most energetic cities in the world – London and Stockholm – their aim being to contribute both local and international experiences and ideas (and showing you how to be healthy and happy whilst at it!). SUSTAIN THE GLOW is not a place where we’ll be preaching about what you can or cannot do; it is simply an inspirational collective of ideas, thoughts, insider tips and recommendations based on our individual experiences and personal practice. Take from it what you want and need: it’s important to find what works for you! Anneli, born and raised in Norway with British parents, graduated with first class honours in Marketing & Communications from IED in Barcelona. With a wealth of experience from working in the communications industry for the past six years and having travelled and lived abroad in various countries, she is now based full-time in London. In-between renovating properties, globe trotting, running her fashion & beauty blog and freelance consulting her true passion has always been optimum health, fitness, beauty and cooking. Suffering from Scoliosis from a young age, she is very focused on fitness to support and strengthen her body, and is constantly trying out new things on the fitness scene. Anneli is also an avid juice cleanser, enjoys scouring local markets for fresh produce and always up-to-date with the latest health craze. Being from the beautiful North, she recognises the importance to disconnect from the hustle and bustle of the big city, and loves nothing more than visiting and spending time with her family, cooking and being in the outdoors (preferably by the ocean). Click here to find out more about Anneli. Born in the UK to British/Mexican parents, Charlotte grew up in the UK, France, Australia, the US and eventually ended up in Sweden, where she lives today. She graduated with a BA in PR with first class honours from the University of Arts London and an MA in Communication from the University of Gothenburg. Having worked within fashion and PR in London she moved to Stockholm in 2011 to challenge herself in a completely new industry. Charlotte’s recognised for her knowledge and insight when it comes to health, trends and market understanding, as well as her health advocacy managing to inspire even the most adamant family and friends. Alongside her full-time job, Charlotte loves to travel, enjoys new food experiences, mentors young individuals and is currently planning her upcoming wedding in Mexico. But most of all she values life’s simple pleasures such as being outdoors in nature and having a quiet night in with her fiancé enjoying a home cooked meal and a movie. Click here to find out more about Charlotte. * We also enjoy regular collaborations with various contributors throughout the site.